the mouth in the body and the body in the soul or spirit. • Have you ever wondered why you keep getting cavities even though you brush your teeth? • Have you wondered why your gums are still bleeding even though you brush your teeth? • Do you always seem to need more treatment every time you go to the dentist? • Does your dentist say that you don’t brush properly? • Do you feel anxious before a dental visit? • Do you feel depressed after the visit? • Have you spent a lot of money but see little result? Your teeth are located in your mouth as everyone knows. But your mouth is an organ in the body and your body is part of your person which includes your mind and emotions as well as your life story. So we acknowledge the whole person, all of you! Your body (biology), your mind and your emotions. It joins all the aspects of your personhood leaving nothing out. It goes as deeply as possible to find root causes and make correction at the level of cause. Dental and medical treatments look at the effects rather than the cause. These effects are the conditions and the diseases in the tissues of your mouth. This might be a decaying tooth or bleeding from the gums. These effects must of course be dealt with but we must not forget the cause. These diseases and conditions are the effects of cause. So treatment can only bring us so far. If the cause of a condition remains then the problems (effects) will surface again. So dealing with the effects (treatment) is helpful only to the degree that we can find and deal with the actual cause. That is why the problems seem to never go away. But when we address the cause, the disease cannot come back again. So Dental Health Synergy joins all aspects of you, the person and leaves nothing out. From your mind and emotions to your lifestyle and habits and your diet, all is included. Dental Health Synergy brings you the bigger picture for your dental health. We honour you, the whole of you, first and foremost and we want to give the power back to where it belongs, to you. Experience Dental Health Synergy and decide for yourself if it can serve you and your health. We hope that it will speak to you and that you will resonate with it. This will give you the answers that you need. 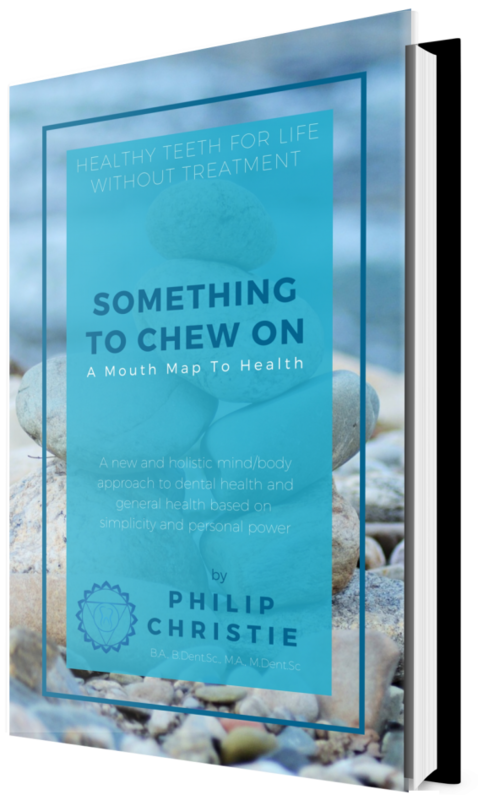 The basic understanding to an holistic dental care approach is given in my book Something To Chew On: A Mouth Map To Health and you can buy it by clicking the Buy Now Button above.